48 • March 2019 • S I G N & D I G I T A L G R A P H I C S WRAPS DIGITAL GRAPHICS to clean the wall. If the surface has been cleaned, but adhesion is poor, you may need to spray the wall to soak, dry and spray again, this time wiping the wall thoroughly. This sweating process helps remove toxins and inconsistencies in the wall that may cause failures." How do you choose the right film? 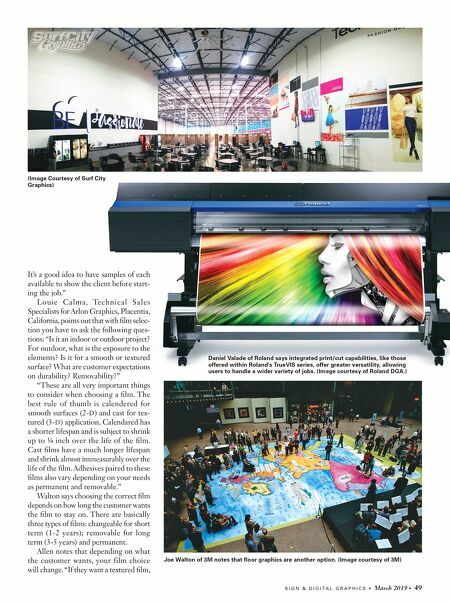 Daniel Valade, Product Manager, Color Products and Cutters at Roland DGA, Irvine, California, says when select- ing the film to use for a specific job, be sure to evaluate the installation surface and take that into consideration before choosing the media. "You should also consider the type of adhesive used by the media manufacturer, as that will make a difference. In addition, it's key to con- sult the media manufacturer's guidelines regarding film and surface compatibility. You need to ensure that the media you select is appropriate for the job, and that it's compatible with the ink set you'll be using. In addition, be sure to 'pre-qualify' the customer to determine whether he or she is looking for matte or gloss finish. 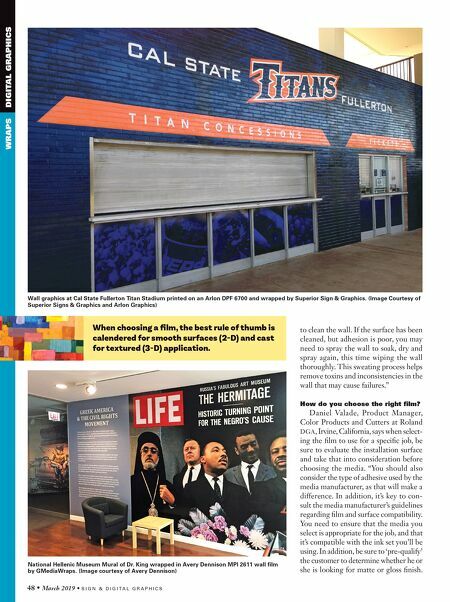 Wall graphics at Cal State Fullerton Titan Stadium printed on an Arlon DPF 6700 and wrapped by Superior Sign & Graphics. (Image Courtesy of Superior Signs & Graphics and Arlon Graphics) National Hellenic Museum Mural of Dr. King wrapped in Avery Dennison MPI 2611 wall film by GMediaWraps. (Image courtesy of Avery Dennison) When choosing a film, the best rule of thumb is calendered for smooth surfaces (2-D) and cast for textured (3-D) application.